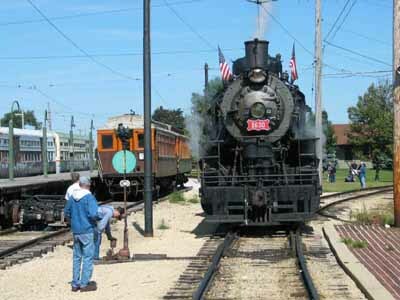 For months I'd been eagerly anticipating Members Weekend at the Illinois Railway Museum. As a L.T.M.N.P.A. (Long-Time Member Not Presently Active), it's a great time to visit Union to see old friends, check out what's new, and see lots of equipment operating that doesn't run much. Admittedly I might be a little biased, but on a mild sunny day there is no better place to be than Union, Illinois. (When it's cold and rainy, it's a different story.) I'd been checking the Weather Channel forecast all week prior to September 20 -21 hoping for a break. 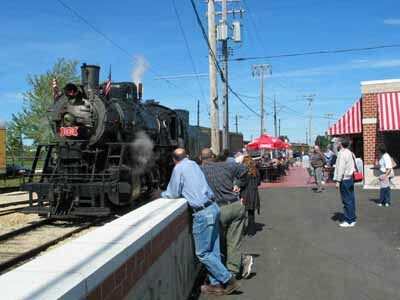 Fortunately the weather gods were kind to IRM for its 50th Anniversary year -- the weather was perfect both days. Since 1969, the annual Member's Day has been a time for IRM workers to take the day off from "work," get together, and celebrate their accomplishments for the year. Plenty of members and their families returned for the 2003 celebration; over 200 tickets were sold at $5 each for the traditional Saturday evening members' outdoor barbecue. Fun's fun, but since IRM needs every dollar of customer revenue it can get, the event is now open to the public and marketed as Museum Showcase Weekend. By the looks of the parking lot, there were plenty of paying customers enjoying the action. I hope they enjoyed themselves as much as I did. 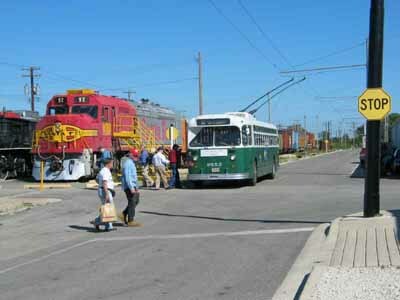 Normally the only way to get to IRM is to drive, but on Saturday over 300 visitors came by train. Soon after I arrived that morning, I heard visitors discussing whether or not to buy tickets for the "Amtrak train." 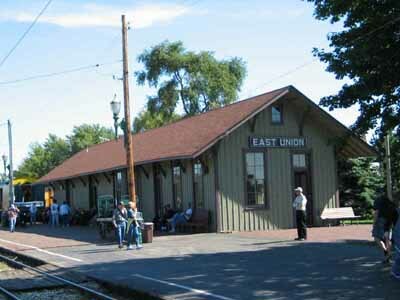 I didn't know what they meant, but I figured it out when an excursion train from Chicago, and the suburbs, backed into the Museum's East Union depot. After some of the passengers detrained, the special continued to Belvidere to turn on the wye, and Museum visitors were invited to make the short round trip to Belvidere and back. 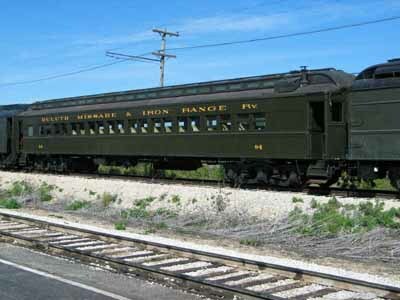 A passenger excursion train operated from Chicago directly to IRM on Saturday. 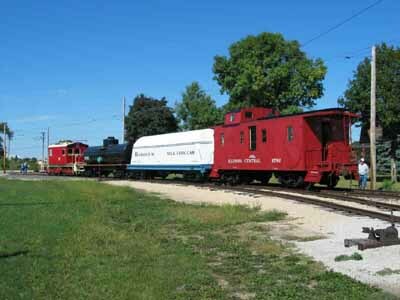 Here the special backs into IRM&apos;s East Union depot past Spaulding Tower (relocated from its original site on the EJ&E). The IRM web cam is located in one of the second-story windows. The Amtrak special unloads passengers on Station Track 2 while a train of CTA 6000-series Rapid Transit cars lays over on Track 1. IRM is a big organization with lots going on. Years ago, the Board realized that a distributed structure was necessary to effectively manage the place. Department Heads (Curators and Superintendents) are in charge of specific collections or facilities. These individuals have considerable authority to establish priorities, develop budgets for Board approval, and plan and carry out the work. As I wandered from place to place over the weekend, I noted what each Department has accomplished for the year and how each was contributing to the weekend's celebration. Just maintaining a fifty-acre developed site with more than a dozen buildings and is quite a chore, to say nothing of making continuous improvements. For years the IRM Board has emphasized improving the site and the fixed facilities. To provide the required attention, the B&G Superintendent is the Museum's first and only full-time salaried Department Head, and a portion of each admission fee is dedicated to a Public Area Improvement Fund. As a result, the grounds look better every year. 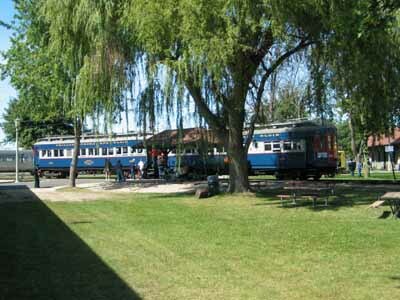 For 2003 the Diner Annex and patio dining areas were completed and opened for food service, a concrete floor was poured in the trolley bus barn, and the woodworking shop annex to the electric car shop was completed. I was a little disappointed that work has not yet begun on two new much-needed car storage "barns," the inexpensive pole buildings IRM erects to provide indoor storage and display for its collection. The Board has set aside the money for the two new barns, but the Museum is having trouble getting timely building permits thanks to tighter and tighter McHenry County development regulations. This trip I took the time to count how much of the rail equipment is undercover: in the eight barns and shops, I came up with 165 pieces kept inside. That's impressive, but there are well over 200 cars and locomotives still outside. Paving of roads and pathways continues year after year. Just in time for Members Weekend, a paved path was completed to allow easier viewing of the large outdoor display of obsolete railroad signals. Dozens of explanatory signs describing each of the signals were prepared and erected only a few days before Members Weekend. These signs join hundreds of others erected around the property in the past few years describing the equipment, the facilities, and interesting aspects of railroading in general. If the East Union depot looks authentic, it should. Moved from the nearby town of Marengo, parts of the building date from 1851, making it oldest railroad station west of Pittsburgh. Inside the depot are displays of railroad artifacts. 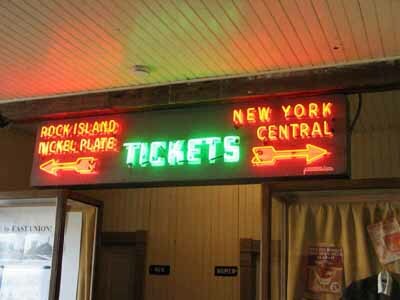 New this year is this restored neon sign from inside LaSalle Street Station. The arrows even blink on and off. 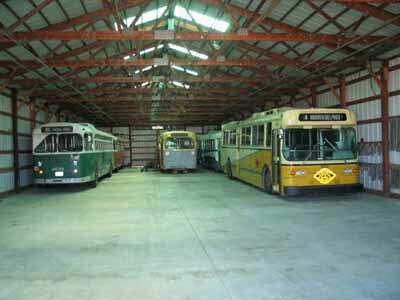 One building improvement project completed this year is paving the trolley bus barn. 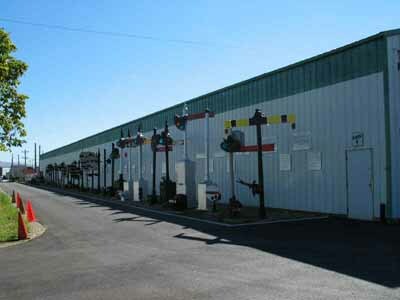 The construction is typical of IRM&apos;s many storage and display buildings. The Museum grounds are really looking good. Here a two-car train of wood CA&E cars loads from the Depot Street Car Stop. Its hard to believe that this location was a low-lying corn field not that many years ago. Depot Street was repaved this year. The lions set out along the side of the road used to hold up the eaves of LaSalle Street Station in Chicago. 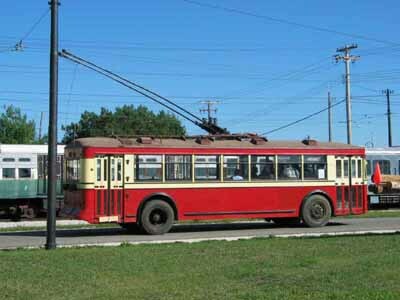 The last trolley coach to operate in Chicago loads passengers at the corner of Depot Street and Central Avenue, two of the paved streets at IRM. 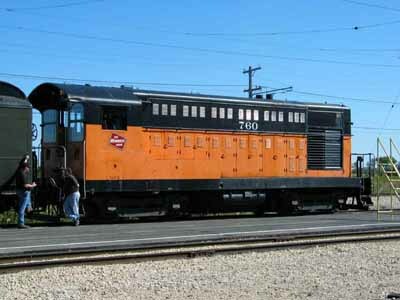 The Santa Fe FP-45 is set up to allow visitors to get in the cab. As historic railroad or transit buildings get demolished in Chicago, IRM is on hand trying to save some of the architectural elements, particularly the entablatures that were built high into the walls announcing the owner. This is the longest one yet, for obvious reasons! The passing Chicago 1923-vintage streetcar has been restored to its later CTA configuration as a one-man car. The broad stripe on the end alerts passengers to board at the front, not at the rear as they would if there were a conductor. 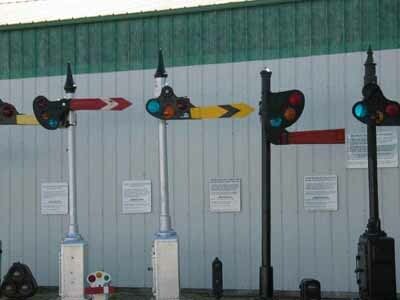 For years, one Museum member has been assembling and mounting this large collection of obsolete wayside signals for display. 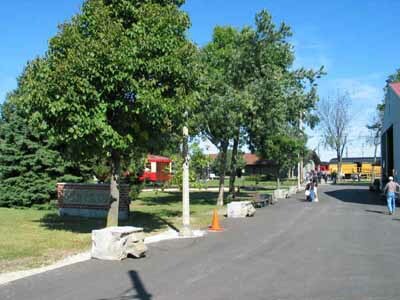 This year a curb was installed and a paved path constructed to allow easier access. Just a few days before Members Weekend, descriptive signs were mounted for every signal on display. IRM's extensive track layout requires constant attention. There are more than 50 turnouts and, I would guess, about eight miles of track in total. For several years a track contractor has been hired each Spring to perform track maintenance and upgrades. Checking in via the Internet on the Museum's Spaulding Tower web cam, I could tell that this year's program included major work on Station Track 2, which had been getting a little rough. 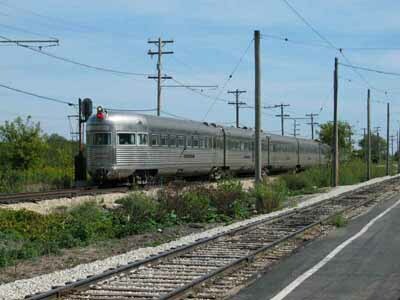 The 4.5-mile mainline is maintained to FRA Class II track standards and is equipped with Automatic Block Signals. I didn't get up into Spaulding Tower to look around, but I understand work is underway to replace or supplement the Absolute Permissive Block signal system with vintage CTC equipment. Station Track 2 (in the foreground) got much-needed tie replacement and surfacing this year. Beyond, the Nebraska Zephyr backs west on the mainline by one of the Absolute Permissive Block signals. 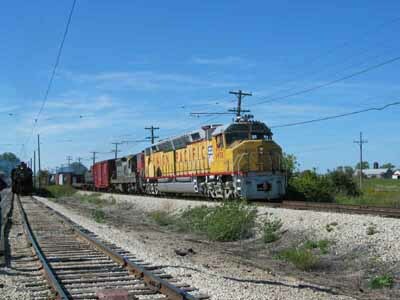 IRM&apos;s 4-mile mainline is fully signaled for multiple train operation. 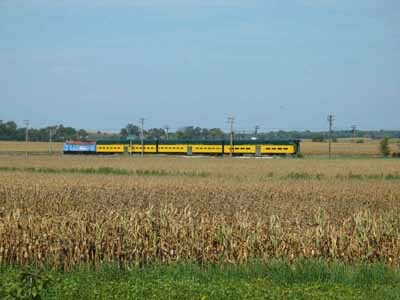 Here CNW bi-level suburban cab car leads a three car train east through the cornfields approaching a meet at Johnson Siding. It will sure be great when Metra 305 can be repainted as CNW 411 to match the bi-levels. The Steam Department is responsible for IRM's 26 steam locomotives. The most recent addition to the steam collection, IC suburban tank engine 201, has been placed on prominent display with signs indicating it is the last existing steam locomotive run by Casey Jones--John Luther Jones was temporarily transferred to the Chicago suburban service to help move the crowds attending the 1893 Columbian Exposition. 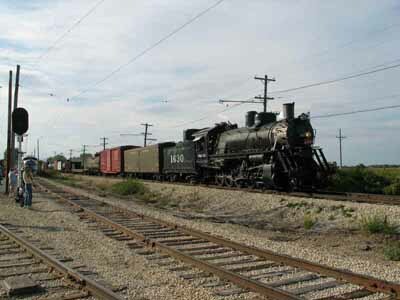 For years Frisco 1630 has been IRM's in-service steam locomotive. 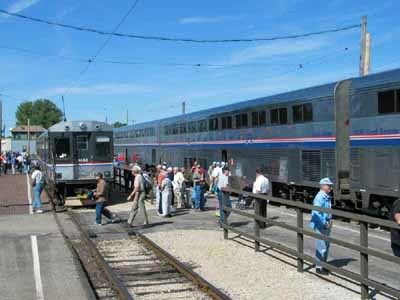 After being sidelined for most of the last two years for needed maintenance and recertification under the new FRA standards, it has performed well during the 2003 operating season. In addition to keeping the 1630 in operation, the steam department makes steady progress on a complete overhaul of UP 428, a 1901-vintage Baldwin 2-8-0. Boiler work is complete and several boiler-mounted appliances are being reinstalled. The Vanderbilt tender is jacked up, the front tender truck is removed and disassembled for wheel work, and the badly deteriorated cab is literally hanging from the ceiling while most of the steel is replaced. The latest addition to the steam locomotive collection is a real gem. Illinois Central 205, a 2-4-4RT double-ended suburban locomotive, was built in 1880 to pull commuter trains south from the loop. 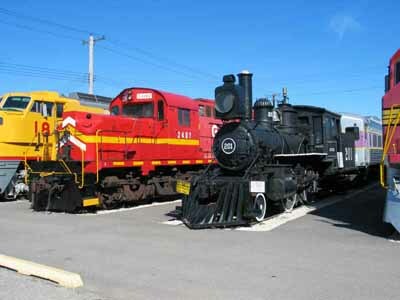 It has been placed on display in IRM&apos;s outdoor display yard, where it is dwarfed by the much more modern locomotives on both sides. 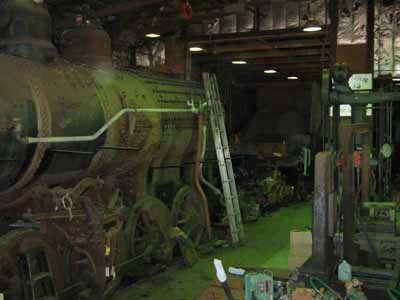 For the last several years, the Steam Department has been completely overhauling UP consolidation 428. 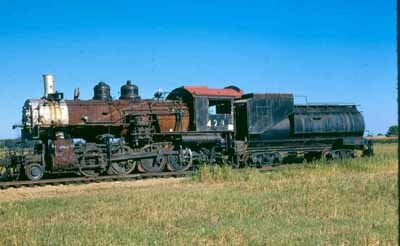 This shot, taken in 1971, shows what the engine looked like before restoration began. It had last operated on the UP in 1958. Boiler work is complete on the 428 and appliances are being reinstalled. Note the fireman&apos;s side injector. The Frisco decapod draws a crowd as it backs past the Diner Annex Saturday morning on its way to the depot to pick up its train. The engine crew needs to hand-switch the 1630 across the streetcar line as it heads around the west leg of the wye. Here the ground man restores the switch for the car line. On the left is the platform of the 50st Street Rapid Transit station, moved intact to the Museum when taken out of service by the CTA. On display at the high-level platform are two 95-year old elevated cars moved outside for Members Weekend. Sunday, the Decapod got a chance to pull the 18-car freight train assembled for the celebration. Unfortunately IRM buys very good coal and the fireman knew his business. There was almost no smoke all weekend! 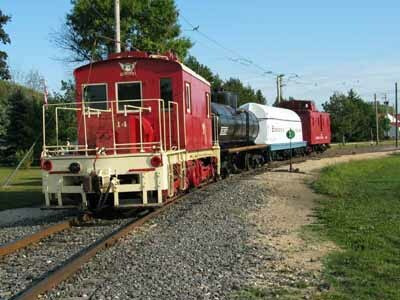 The car behind the tender is not part of the freight train. GPEX 1021, a Bowman Dairy milk car, is used as a cleverly camouflaged auxiliary water tender for the 1630. The Diesel Department, as it is more commonly called, is responsible for more than 40 units. Running for Member's Weekend was the latest to arrive on the property, SP 1518, the first GP7. Like the other EMDs in the collection, it was manufactured at LaGrange, Illinois, 50 miles southeast of Union. The Diesel Department has finished turning half of one barn into a heated, well-lit shop able to handle 8 units on four tracks so that work can continue all year. Inside several units are getting body and structural repairs. For Members Weekend, the Department had four EMD units powered up and in service. They also had the control equipment functioning on Union Pacific 6930, a huge DDA40X, so that it could operate as a leading unit with SP1518 providing the tractive effort. The yard switcher for the day was Milwaukee 760, the first Fairbanks Morse diesel locomotive--built just 50 miles northwest of Union, in Beloit, Wisconsin. Late Sunday as I was leaving MN&S 21, a center-cab Baldwin transfer unit, burbled out of the diesel yard into the station area. I didn't stay around long enough to figure out what it was up to. The Diesel crew also keeps the Nebraska Zephyr train set and the three CNW gallery cars in top notch operating condition, and both train sets were in service for the celebrations. There was lots of activity apparent inside the new diesel shop. CNW 1518, the first GP7, is getting major structural work to repair years of corrosion while being backdated with a steam boiler and the correct original style control equipment. Behind is a Milwaukee E-9 getting a new skin. 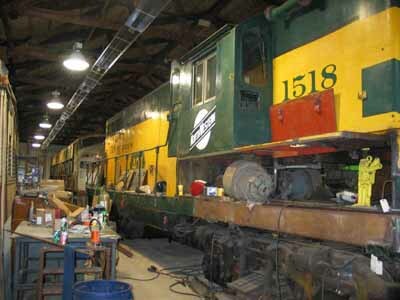 Two tracks over in the diesel shop, Milwaukee 1603, an Alco HH-600 switcher built in 1939 is about ready to be released from the shop as soon as the gray is repainted. Behind it is UP M35, a 1927 EMC motor car. Its getting a new roof this year so didn&apos;t operate on Members Weekend as it has in the past. M35 is one reason the Internal Combustion Department can&apos;t officially be called the Diesel Department, since it still had a gasoline engine! 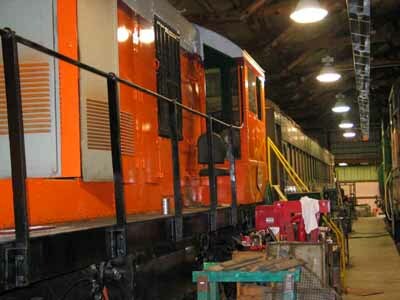 This year the Diesel crew got the cab equipment operating on IRM&apos;s D-D Centennial so that it could lead an MU consist. Here IRM&apos;s latest diesel acquisition, SP 1518 provides the tractive effort as the freight train heads past the station on the mainline at the authorized 25 mph. Switching duties for the weekend were handled by the first Fairbanks Morse switcher built, Milwaukee 760. The Coach Department name is a little misleading. They are responsible for over 50 conventional passenger and head-end cars off all types, not just coaches. Unfortunately until new barns are constructed only about 20 can be kept indoors. 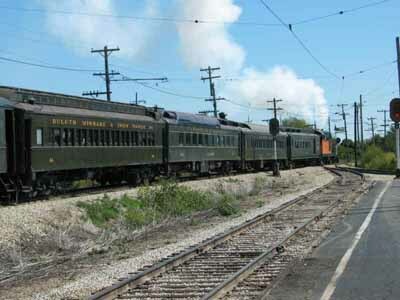 A major project this year is repainting four Rock Island commuter cars so they can relieve the three DL&W Boonton Line suburban coaches on the regular passenger train. The crew is also working to make sure cars which cannot be stored inside are water tight to prevent further deterioration. They continue to display the interiors of several of the most interesting cars in Barn 3, which is dedicated to conventional passenger equipment. It has floor-level walkways so the interiors can be viewed from through the windows when the cars are not actually open to visitors. 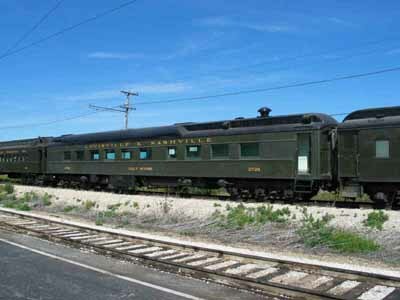 The Coach Department put away the regular Boonton Line coaches and brought out the big guns in honor of Members Weekend, providing a six-car train of heavyweight equipment, all with six-wheel trucks, all painted Pullman green. 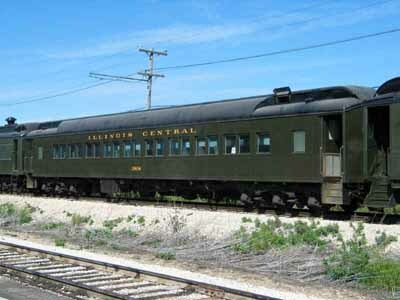 The consist included a CB&Q RPO, Santa Fe combine, Illinois Central mainline coach, L&N diner, DM&IR coach, and Pullman open-end lounge-observation car Inglehome. The 760 got a chance to notch out a little when moving the heavyweight passenger train. It made more smoke than the Decapod! and, bringing up the markers, a 1910 Pullman product, the lounge observation car Ingleholme. The freight car department has been very active in the last few years restoring cars already in the collection and obtaining "new" ones to fill out the collection. There are about 90 freight cars at Union, many obtained mainly to provide inexpensive storerooms. At the moment only three or four can be stored inside. Three of this year's restoration projects were on display and available for tours near the Depot both Saturday and Sunday. However, the best demonstration of the Freight Car Department's efforts was an 18-car freight train operated throughout the weekend. Most of the cars still equipped with friction bearings. It was a treat for the eyes and the ears to see and hear it clatter by on the mainline at 25 mph several times each day. Besides supplying an 18-car freight train for mainline operation, the Freight Car Department provided tours throughout the weekend of three of this year&apos;s projects. The caboose has been completely restored inside and out. The "butter-dish" milk car received mechanical work and a new paint job. The tank car, which just arrived a few weeks ago, was completely rebuilt off -site and is being lettered. 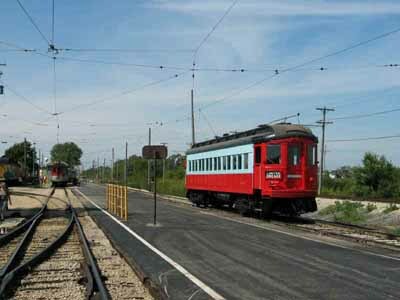 IRM started out 50 years ago as the Illinois Electric Railway Museum. Even though conventional railroad equipment now outnumbers electric equipment by two to one, the Car Department is still responsible for the largest single collection: 125 streetcars, interurbans, and rapid transit cars. Unlike the steam and diesel shop floors, the electric car shop floor is still not heated, though the adjacent work areas are. A recent building addition has allowed the Car Department to set up and begin using woodworking machines obtained years ago. I saw a stack of new wood carlines recently produced in the wood shop for the UP M35 motor car. 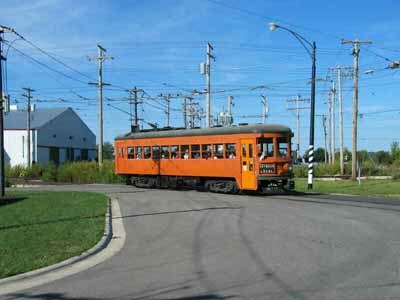 In the car shop were several major long-term projects nearing completion, including Sand Springs 68, considered by many as the first light-weight interurban, and Chicago and West Towns streetcar 141, which has been completely rebuilt from a backyard shed. Since most of the electric cars have wood and canvass roofs, they are particularly susceptible to weather damage. Fortunately 100 of the electric cars and locomotives are kept inside. Seventeen pieces of the electric car collection operated for Members Weekend, many of them in Multiple-Unit service. It was nice to see the IT Class B locomotive pulling a train becuase it doesn't get out often. 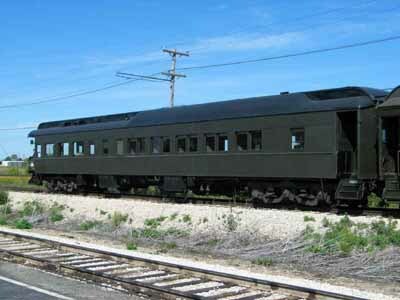 The real thrill for me, though, was to see and ride Indiana Railroad 65, one of the famous high-speed lightweight cars built in the early 1930's in a futile effort to save the interurbans. 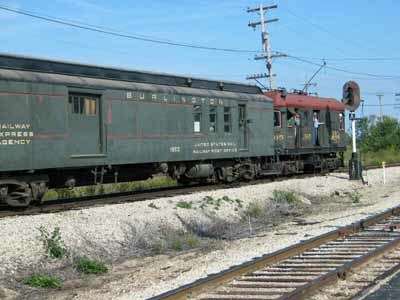 The Illinois Electric Railway Museum was founded 50 years ago to preserving this very car. Out on the mainline, holding this speedster down to the IRM speed limit was a real challenge for the motorman! 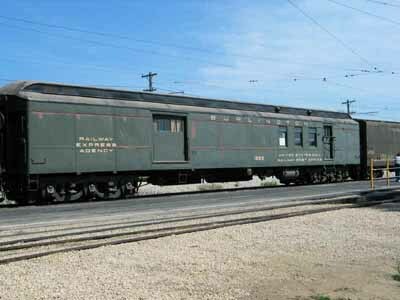 The Electric Car Department provided the motive power for the "electric freight" in the form of this ex-Springfield Terminal steeple cab. IT Class B 1565 made a rare appearance, and took a shot at pulling the six-car heavyweight passenger train. No speed records were recorded, but the Class B made it out and back without incident. Here it heads back west past the station, near the end of the round trip. CA&E steel car 431, currently being extensively refurbished, was far enough along to sneak out of the electric car shop Sunday and make several revenue trips. 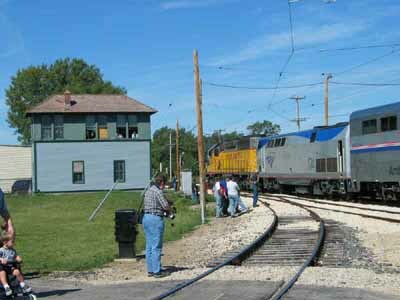 On the left is a two-car North Shore interurban train loading passengers in front of the depot. Saturday a three-car North Shore MU train had operated. Indiana Railroad high-speed 65 came out for a few trips in honor of the occasion. 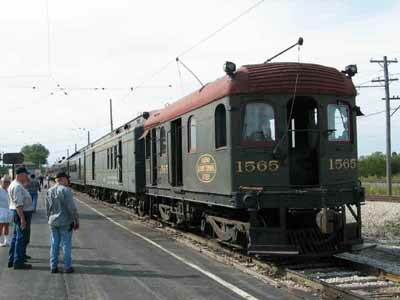 This is the first car preserved by IRM 50 years ago. 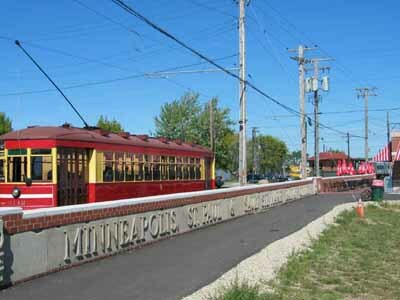 Here it is shown at Electric Park on the streetcar loop. IRM has a Motor Bus and Trolley Bus Departments to complement its electric car collection. The Trolley Bus crew worked hard and successfully got Chicago Surface Lines 84 running for Members Weekend, although restoration is far from complete. 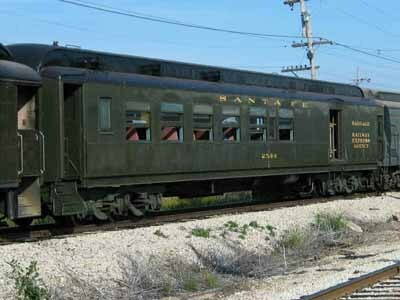 Built by Brill-American in 1930, the "crackerbox" is the oldest preserved trolley coach in the United States. IRM has a large, well-trained, and disciplined operating department. They did their usual great job dispatching and running multiple trains: at times there were as many as ten trains in service, with six or seven moving at a time. Add in the Amtrak special, which moved to and from the Union Pacific interchange three times on Saturday, and it was quite a performance. Driving to O'Hare airport Sunday night, I mentally counted up the number of cars and locomotives I had seen operate on Museum tracks over the weekend. The total was 68 pieces of IRM equipment, along with six from Amtrak and one from Union Pacific. The property looks great, there are more static displays each year, and the equipment is getting lots of TLC. Membership turnout was very strong, and I was delighted to see lots of young children with their member parents at the barbecue. Given the size of the non-member turnout, IRM should have made some money even with lots of "deadheads" like me. There really is no better place to be on a mild sunny day than Union, Illinois.